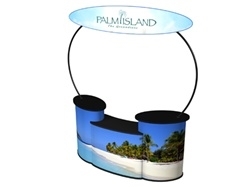 Use this Connector SOLO Curvo No Shelves Kit as a trade show display counter or desk area indoors or outdoors. The (2) SOLO Standards, (2) Curvo Posts, (1) SOLO Connector, and (1) Large Header Sign create a one of a kind presentation space with the added bonus of storage. Add full wrap detachable graphics to advertise or enhance your logo or marketing message!